The Eastern Regional High School golf team has gradually improved its finish at the Camden County Open the past three years. In 2014, Eastern finished in third place at the Camden County Open. In 2015, the Vikings finished in second place in the tournament. 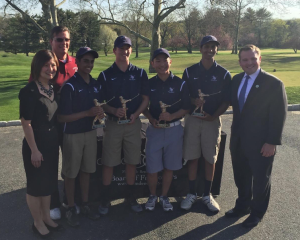 This year, Eastern finally finished on top, winning the team competition on April 18 at Tavistock Country Club in Haddonfield. The Vikings shot a team total of 341 on the 18-hole course to finish in first place, edging second place Haddonfield by just two strokes. Just as the Vikings have improved their Camden County Open finishes, the 2016 team is improving as this season wears on. The Camden County Open victory is the high point for the team after it started the season with a 1–4 record. Eastern’s losses came against tough competition, including undefeated Washington Township High School and one-loss teams Lenape High School and Shawnee High School. Two of the matches were also very close. Eastern only lost to Shawnee by one stroke and to Lenape by five strokes. “Our early losses have showed we’re resilient and we can still push through and play better in the future,” senior Aryaman Shanigaram said. The Vikings faced more challenges on the course at Tavistock. The team played on the first nine holes of the course during an early season scrimmage. Outside of that, however, the foursome of Shanigaram, Patel and sophomores Justin Choi and Joel Hark were not familiar with the course. “The greens were very slopey and fast,” Shanigaram said of the course. “The rough was a good four inches thick,” Hark added. Hark was Eastern’s second-highest scorer, shooting an 11-over-par 83. He made adjustments at the tee box throughout the day. “The biggest challenge for me personally, it was my own driver swing and just hitting through shots,” Hark said. Eastern’s foursome would overcome numerous challenges to have a solid day. Patel led the Vikings with a 9-over-par 81. Patel said he was motivated playing with Highland Regional High School’s Jake Storako, the tournament’s individual winner for the third consecutive season. Even more important than winning the Camden County Open has been the upward trajectory of the Vikings. The team shot a 173 in the opening match against Washington Township. The team has shot a lower score in every match since. “We’re trying to not do too much and play with what we’re good at,” Shanigaram said. Choi said this year’s team is tighter than in the past, and the bond between the golfers has helped the team improve over the past few weeks. The Camden County Open title is just a small triumph in a season with numerous tournaments still to come. Eastern still has to compete in the Olympic Conference Tournament and the Carl Arena/Al Rifkin Memorial Golf Tournament featuring schools from all around South Jersey. Choi believes the team needs to improve its consistency if it wants to win more hardware later in the season. “We’re trying to have the good moments when it matters,” Choi said.